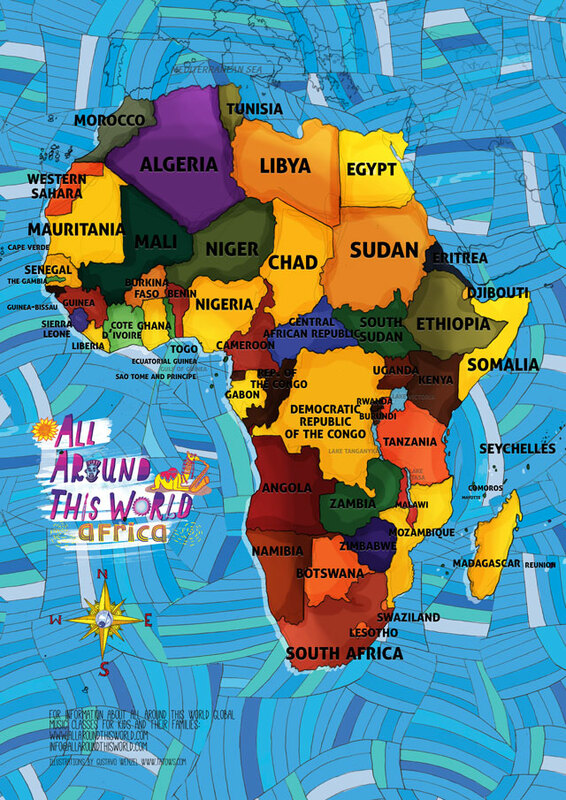 All Around This World’s classroom and homeschool lessons about Africa for kids introduce your family to African cultures through interactive fun . . . The only way one could conceivably consider “Africa” as a single, homogeneous entity is by stepping back–way back, actually, as far as outer space–where a whole-earth photograph shows Africa as a geographically distinct mass of land, connected in literal terms to the rest of the world by just a tiny strip of desert in the far northeast. The fact that the land mass has distinct boundaries, coupled with the knowledge that there are some consistent historical narratives that unfortunately appear time again again across the continent, somehow empowers much of the rest of the world to lump the extraordinary number of cultures, languages, religions and ways of life found around Africa into one. — Uganda: we flail our arms and legs and dance dance dance the Amagunju to try to please the Bagandan infant king. — Ethiopia: we shake our shoulders, eskista-style. — Zanzibar (Tanzania): we celebrate a Tanzanian version of Nowruz by celebrating Mwaka Kogwa, hitting each other with (imaginary) banana leaves to get a step ahead of all potential disagreements in the service of happy year. — Algeria: we live the history of the nation through rai. — Mali: we sing the praises of our children as if we were griots. — South Africa: we stomp out secret messages with our gumboot. — Madagascar: we end our journey by lining up and dancing the kilalaky.